These articles may be downloaded for personal use only. Any other use requires the permission of the copyright holder. "Aviation turbulence: dynamics, forecasting, and response to climate change"
"A self-calibrating wide range electrometer for in-cloud measurements"
"A census of atmospheric variability from seconds to decades"
"Global response of clear-air turbulence to climate change"
"A miniature oscillating microbalance for sampling ice and volcanic ash from a small airborne platform"
"Increased light, moderate, and severe clear-air turbulence in response to climate change"
"Stochastic parameterization: toward a new view of weather and climate models"
"Improved climate simulations through a stochastic parameterization of ocean eddies"
"Editorial: Focus on stochastic flows and climate statistics"
"On the detection and attribution of gravity waves generated by the 20 March 2015 solar eclipse"
"Coordinated weather balloon solar radiation measurements during a solar eclipse"
"Impact of the North Atlantic Oscillation on transatlantic flight routes and clear-air turbulence"
"Transatlantic flight times and climate change"
"Is there a rhythm of the rain? An analysis of weather in popular music"
"The composite-tendency Robert–Asselin–Williams (RAW) filter in semi-implicit integrations"
"The dynamics of baroclinic zonal jets"
"A balloon-borne accelerometer technique for measuring atmospheric turbulence"
"Advanced Review: Stochastic climate theory and modeling"
"Intensification of winter transatlantic aviation turbulence in response to climate change"
"Achieving seventh-order amplitude accuracy in leapfrog integrations"
"Mathematics applied to the climate system: outstanding challenges and recent progress"
"Climatic impacts of stochastic fluctuations in air–sea fluxes"
"Comment on "A modified leapfrog scheme for shallow water equations" by Wen-Yih Sun and Oliver M. T. Sun"
"An improvement in clear-air turbulence forecasting based on spontaneous imbalance theory: the ULTURB algorithm"
"Meteorological phenomena in Western classical orchestral music"
"The RAW filter: an improvement to the Robert–Asselin filter in semi-implicit integrations"
"The effects of the RAW filter on the climatology and forecast skill of the SPEEDY model"
"Generation of inertia–gravity waves in the rotating thermal annulus by a localised boundary layer instability"
"Testing the limits of quasi-geostrophic theory: application to observed laboratory flows outside the quasi-geostrophic regime"
"The role of mean ocean salinity in climate"
"A proposed modification to the Robert–Asselin time filter"
"Reply to comments on 'Application of the Lighthill–Ford theory of spontaneous imbalance to clear-air turbulence forecasting'"
"Rapid climate change: an overview for economists"
"QUAGMIRE v1.3: a quasi-geostrophic model for investigating rotating fluids experiments"
"Inertia–gravity waves emitted from balanced flow: observations, properties, and consequences"
"Application of the Lighthill–Ford theory of spontaneous imbalance to clear-air turbulence forecasting"
"Sudden stratospheric warmings as noise-induced transitions"
"Introduction. Stochastic physics and climate modelling"
"Dynamics of convectively driven banded jets in the laboratory"
"A new feedback on climate change from the hydrological cycle"
"On the climate response of the low-latitude Pacific Ocean to changes in the global freshwater cycle"
"Modelling climate change: the role of unresolved processes"
"On the generation mechanisms of short-scale unbalanced modes in rotating two-layer flows with vertical shear"
"A calibrated, non-invasive method for measuring the internal interface height field at high resolution in the rotating, two-layer annulus"
"Jupiter's and Saturn's convectively driven banded jets in the laboratory"
"Stochastic resonance in a nonlinear model of a rotating, stratified shear flow, with a simple stochastic inertia–gravity wave parameterization"
"Spontaneous generation and impact of inertia–gravity waves in a stratified, two-layer shear flow"
"The role of nonhydrostatic dynamics in controlling development of a surface ocean front"
Williams, P. D. (ed. ), details at agupubs.onlinelibrary.wiley.com/hub/issue/10.1002/(ISSN)1944-8007.ATMOS_VARIABILITY, Geophysical Research Letters, 2017. "Focus on Stochastic Flows and Climate Statistics"
Marston, J. B. and Williams, P. D. (eds. ), details at iopscience.iop.org/1367-2630/focus/Focus%20on%20Stochastic%20Flows%20and%20Climate%20Statistics, New Journal of Physics, 2016. "Mathematics Applied to the Climate System"
Williams, P. D., Cullen, M. J. P., Davey, M. K. and Huthnance, J. M. (eds. ), details at http://rsta.royalsocietypublishing.org/site/2013/1991.xhtml, Philosophical Transactions of the Royal Society A, 371(1991), 2013. "Stochastic Physics and Climate Modelling"
Palmer, T. N. and Williams, P. D. (eds. ), details at http://rsta.royalsocietypublishing.org/site/issues/stochastic-climate.xhtml, Philosophical Transactions of the Royal Society A, 366(1875), pp 2419-2641, 2008. "Modeling Atmospheric and Oceanic Flows: Insights from Laboratory Experiments and Numerical Simulations"
Palmer, T. N. and Williams, P. D. (eds. ), details at www.cambridge.org/9780521761055, Cambridge University Press, pp 496, ISBN 978-0-521-76105-5, 2009. Williams, P. D., Chapter on 1922 (pp 124-125) in Weather: An Illustrated History: From Cloud Atlases to Climate Change, Andrew Revkin and Lisa Mechaley, details at www.sterlingpublishing.com/9781454921400, Sterling Publishing, pp 224, ISBN 978-1-4549-2140-0, 2018. "Clear-air turbulence in a changing climate"
"Leapfrogging into the future: How child's play is at the heart of weather and climate models"
Williams, P. D., Chapter 45 (pp 168-171) in 50 Visions of Mathematics, Edited by Sam Parc, Foreword by Dara O Briain, details at ukcatalogue.oup.com/product/9780198701811.do, Oxford University Press, pp 208, ISBN 978-0-19-870181-1, 2014. 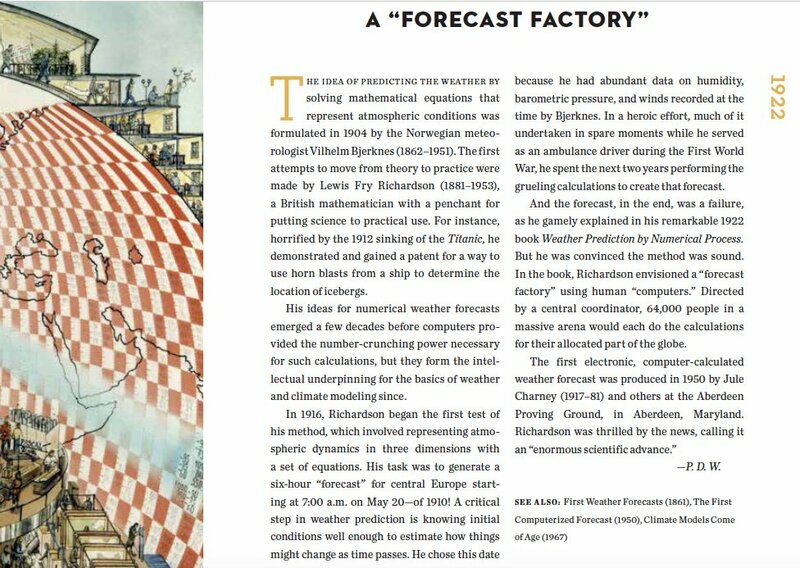 Williams, P. D., Bulletin of the American Meteorological Society, 93(2), pp 242-243, 2012. "Research Collaborations for Better Predictions of Aviation Weather Hazards"
"Stronger turbulence causes a stir"
Williams, P. D. and Storer, L. N., University of Reading Connecting Research: The Forum blog, 9 October 2017, on-line at blogs.reading.ac.uk/the-forum/2017/10/09/stronger-turbulence-causes-a-stir. Harrison, G., Airey, M., Marlton, G., Nicoll, K. and Williams, P. D., Meteorological Technology International, pp 54-56, September 2017. Yau, A., Dombard, A., Peterson, W. K. and Williams, P. D., AGU Eos Editors' Vox blog, 25 May 2017, on-line at eos.org/editors-vox/close-encounter-with-jupiter. "Passagiere müssen sich auf holprigere Flüge einstellen - wegen des Klimawandels"
Williams, P. D., Neue Energie, pp 54-55, May 2017. "Guest post: Air passengers face a bumpier ride due to climate change"
Williams, P. D., Carbon Brief, 6 April 2017, on-line at www.carbonbrief.org/guest-post-air-passengers-face-bumpier-ride-climate-change. "The politics of climate change may be stalling - but business is rising to the challenge"
Williams, P. D., University of Reading Connecting Research: The Forum blog, 25 January 2017, on-line at blogs.reading.ac.uk/the-forum/2017/01/25/the-politics-of-climate-change-may-be-stalling-but-business-is-rising-to-the-challenge/. "The Impacts of Climate Change on Aviation: Scientific Challenges and Adaptation Pathways"
Puempel, H. and Williams, P. D., ICAO Environmental Report 2016: On Board A Sustainable Future, pp 205-207, 2016, on-line at www.icao.int/environmental-protection/Pages/ENV2016.aspx. "New Geophysical Research Letters Editorial and Revisions Policies"
"Controversy: A Crucial Ingredient for Scientific Progress"
Williams, P. D., AGU Eos Editors' Vox blog, 13 June 2016, on-line at eos.org/editors-vox/controversy-a-crucial-ingredient-for-scientific-progress. Williams, P. D., Eos, 97(5), inside back cover, 1 March 2016. "Letters: Weather scientists cite Bob Dylan too"
"Let's share our music of the spheres"
Williams, P. D., Institute of Physics Environmental Physics Group newsletter, p 9, September 2013. "Moon's a balloon: Balloon-borne measurements for Earth weather and space weather"
Harrison, G., Nicoll, K., Marlton, G. and Williams, P. D., Meteorological Technology International, pp 78-82, August 2013. "Correction [to "How mathematical models can aid understanding of climate"]"
"How mathematical models can aid understanding of climate"
"How Mathematical Models Can Aid Our Understanding of Climate"
Williams, P. D., Cullen, M. and Huthnance, J., Mathematics Today, 47(6), p 274, December 2011. "Secretary's Report 2009-2010 from the 19th Annual General Meeting held on 26th May 2010"
Williams, P. D., Institute of Physics Environmental Physics Group newsletter, p 8, October 2010. "Geophysical Research Letters: New Policies Improve Top-Cited Geosciences Journal"
Calais, E., Diffenbaugh, N., D'Odorico, P., Harris, R., Knorr, W., Lavraud, B., Mueller, A., Peterson, W., Rignot, E., Srokosz, M., Strutton, P., Tyndall, G., Wysession, M. and Williams, P., Eos, 91(38), p 337, 21 September 2010. "Working Group E report: What Is Climate?" Chandler, R. (Chair), Williams, P. D. (Rapporteur), Anderson, C., Crommelin, D., Farmer, C., Held, H., Huthnance, J., Jupp, T., Stainforth, D., Tett, S., Turasie, A., Watkins, N. and Yip, S. Isaac Newton Institute for Mathematical Sciences satellite workshop on Probabilistic Climate Prediction, University of Exeter, 20-23 September 2010. "Computer Simulation and the Environment"
Williams, P. D., Institute of Physics Environmental Physics Group Newsletter, pp 7-8, October 2009. "Report from breakout group 1: How can work in nonlinear PDEs most benefit climate prediction?" Williams, P. D. (Chair) and Wlasak, M. (Rapporteur), on-line at www.maths.ox.ac.uk/groups/oxpde/events/upcoming-events, Workshop on the Mathematics of Weather and Climate Prediction, Met Office, Exeter, 2009. "European Meteorological Society Young Scientists Travel Award Report"
Williams, P. D., on-line at www.emetsoc.org/awards/award_descriptions.php, October 2009. Williams, P. D. and Birner, T., NCAS Annual Report 2008-2009, p 25, 2009. "MP–Scientist Pairing Scheme: a knowledge transfer case study"
Williams, P. D., Using NERC Science, on-line at www.nerc.ac.uk/using/casestudies/pairing.asp, March 2009. "A multitude of gravity waves"
"Modelling planetary atmospheres: problems and solutions"
Williams, P. D., The Observatory, 125(1187), pp 204-207, August 2005. "Working Group 3 report: The parameterisation problem in weather and climate models"
Ghil, M., Berloff, P., Buizza, R., Hermanson, L., Miller, M., Palmer, T., Roulstone, I., Sardeshmukh, P. and Williams, P. D., In Proceedings of the Workshop on Representation of Sub-Grid Processes using Stochastic–Dynamic Models, pp xvii-xxii, ECMWF, 6-8 June 2005. "Climate change prediction: a challenging scientific problem"
Williams, P. D., Institute of Physics Environmental Physics Group Newsletter, pp 5-6, Spring 2005. "Global Warming, Local Warning: a study of the likely impacts of climate change upon South East England"
Williams, P. D., commissioned by Dr. Caroline Lucas MEP, published by the European Parliament, Brussels, pp 16, 2004. "Climate change and the thermohaline circulation"
Williams, P. D., Institute of Physics Environmental Physics Group Newsletter, pp 9-10, Spring 2004. "QUAGMIRE: QUAsi-Geostrophic Model for Investigating Rotating fluids Experiments. Reference Manual for Version 1.2"
Williams, P. D., Haine, T. W. N., Read, P. L., Lewis, S. R. and Yamazaki, Y. H., AOPP Technical Memorandum Series 2004.3, Department of Physics, University of Oxford, pp 27, 2004. Williams, P. D., The Grove: Lincoln College Murray Society Newsletter, 1(11), Summer 2003. "Nonlinear interactions of fast and slow modes in rotating, stratified fluid flows"
Williams, P. D., D.Phil. thesis, Department of Physics, University of Oxford, pp 205, 2003. "Royal Meteorological Society Legacies Fund Report"
Williams, P. D., on-line at www.rmets.org/activities/awards/grants/detail.php?ID=264, April 2003. Williams, P. D., The Oxford Student, 28 February 2002. "Interactions of 'fast' and 'slow' modes in rotating, stratified flows"
Williams, P. D., D.Phil. Third Year Report, Department of Physics, University of Oxford, pp 6, 2002. Williams, P. D., D.Phil. Second Year Report, Department of Physics, University of Oxford, pp 52, 2001. Williams, P. D., D.Phil. First Year Report, Department of Physics, University of Oxford, pp 59, 2000. "Comparison of the Non-Hydrostatic, Hydrostatic and Convectively-Adjusted Navier–Stokes Equations in Physical Oceanography"
Williams, P. D., M.Phys. report, Department of Physics, University of Oxford, pp 50, 1998. Tel: +44 (0)118 378 8424 © The University of Reading.